A chairde Gael, a chairde na hÉireann agus a chairde uilig, is mór an ónóir dom seasamh faoi scáth Leacht Cuimhneacháin na nGael anseo ag Battery City Park an tráthnóna brea Domhnaigh seo. 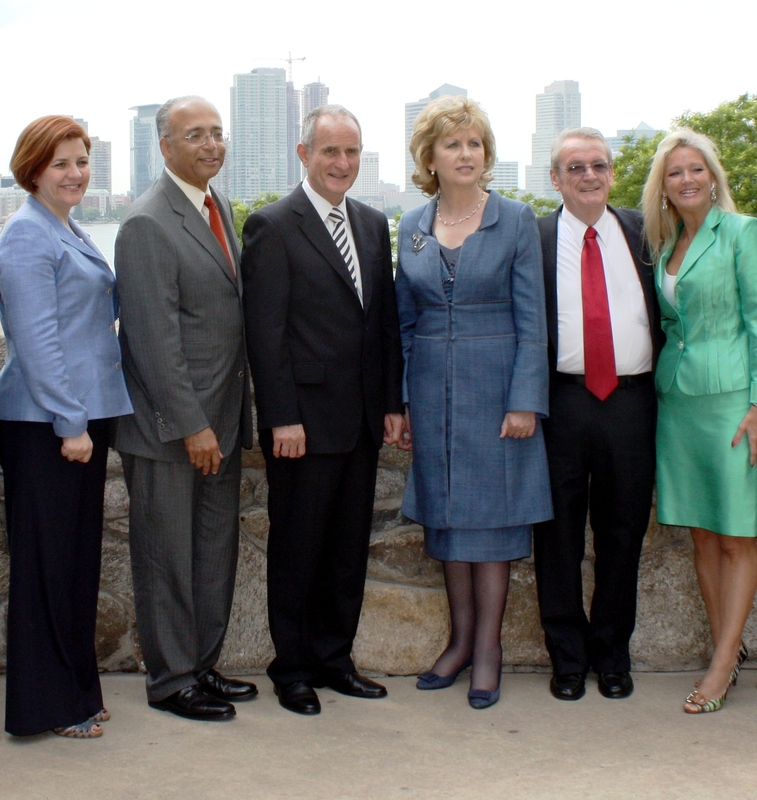 Chairman of the Irish Famine Memorial Foundation, James F. Gill, Minister Carey and distinguished guests, dear friends, it is a very special joy to return to New York and the place of sacred care for the memory of the two million men, women and children lost to Ireland through starvation or forced emigration during the worst years of An Gorta Mór – The Great Hunger. I had the privilege of being here for the dedication of the memorial in July 2002 and it was evident then that this little piece of a Mayo history and landscape would become much loved and much visited and it would surely vindicate the passion of those who created it, a passion for remembering the sufferings of the past and a passion to draw attention to all who suffer hunger today. Many of those who arrived here from that famine scourged 19th century Ireland would have longed for their homeland despite the hardships they had endured. Many of them would have given anything to see an Irish homestead here in Manhattan with its stones and plants, its modest little cottage. We in Ireland have been blessed by the fact that they and their descendants, never forgot their native land, never lost their love of her culture and heritage and stayed bound to her through all the ups and downs of history. Their dollars faithfully sent home from the humblest of incomes helped stem the tide of poverty and helped to educate the next generation. Their active interest helped in the struggle for independence and more recently in the effort mobilized to achieve peace in Northern Ireland. We are proud of our global Irish family and its solidarity across the miles and down through the many generations. The Great Hunger radically altered the course of Irish history and of American history. The millions who suffered were routinely neglected and overlooked by those in authority. Many died believing they counted for nothing in this world. This memorial is our generation’s way of saying that their voices and their stories still matter in the 21st century where they are a call not simply to remember a distant past but a challenge to remember and take responsibility for the present. Each person who suffers hunger in today’s world, is an affront and a scandal to the memory of our ancestors and every time we involve ourselves in alleviating today’s suffering we make this memorial an engine of change, a leaven of hope. In PS 197 in Brooklyn, I was impressed and moved by the impassioned presentation of the school-children who not only articulated a simple and crystal clear vision of the tragedy of the famine but, equally impressively, showed an appreciation of the responsibility we must all shoulder in the face of current global challenges of poverty, hunger and climate change. The Consulate General is currently hosting the Quinnipiac An Gorta Mór- the Great Hunger exhibition that seeks to make sense of the abyss of despair that can rise up from the depths of such tragedy. It is worth seeing just as it is worth reflecting on the remarkable goodness that such tragedy can also inspire. The Jewish Community of this city raised significant sums of money in 1847 for the relief of famine in Ireland. They were not outreaching to friends or relatives but to strangers to whom they felt linked by a common humanity. It was lovely to be able to recall and give thanks for that generosity this week at a remembrance event at the Shearith Israel synagogue. And just a few moments ago at the Mercy Corps offices, I heard the boys and girls of P.S. 158 sing a haunting song that showed how well they understand what it is the voices of the hungry are saying to us. This memorial ensures that those voices cry out even in the very heart of this great and busy city. To our Irish famine dead it gives a living mission in today’s world and I thank New York for remembering their pain, for respecting them so graciously and for insisting that we vindicate their lives and deaths by making this awful, avoidable suffering a thing of the past, right across the globe. Go raibh míle maith agaibh ar fad is go n-éirí go geal libh. 16 Bealtaine 2010. Reáchtáladh Cuimhneachán Náisiúnta 2010 an Ghorta Mhóir ar an Domhnach 16 Bealtaine, i sráidbhaile Mhuraisce, ag bun Chruach Phádraig.Eagraíodh clár de léachtaí agus imeachtaí don tseachtain díreach roimh an ócáid. Leagadh béim sa chlár imeachtaí ar ghnéithe stairiúla an Ghorta Mhóir in Éirinn, trí Ealaín, Seandálaíocht, Stair, Litríocht, Amhráin agus Ceol, agus leagadh béim ar réaltacht an ghorta atá i réim ar fud an domhain sa lá atá inniu ann.